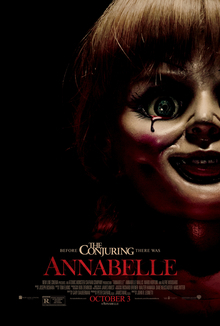 Annabelle premiered at the TCL Chinese Theatre in Los Angeles on September 29, 2014, and was theatrically released in the United States on October 3, 2014. The film received generally negative reviews from critics but was a box office success, grossing over $257 million against its $6.5 million production budget. A prequel, titled Annabelle: Creation, was released on August 11, 2017. A sequel, Annabelle Comes Home, will be released on June 28, 2019. In 1967 in Santa Monica, CA, John Form, a doctor, presents his expectant wife Mia with a rare vintage porcelain doll as a gift for their first child to be placed in a collection of dolls in their daughter's nursery. That night, the couple is disturbed by the sounds of their next door neighbors, the Higgins, being murdered during a home invasion. While Mia calls the police, she and John are attacked by the Higgins' killers. The police arrive and shoot one killer, a man, dead while the female killer commits suicide by slitting her throat inside the nursery while holding the porcelain doll. News reports identify the assailants as the Higgins' estranged daughter, Annabelle, and her unidentified boyfriend, both members of a cult. In the days following the attack, a series of paranormal activities occurs around the Form's residence. Afterwards, Mia gives birth to a healthy baby girl. She and John name their child Leah. The family rents an apartment in Pasadena and, after finding the doll that John had discarded since Annabelle's previous attack in one of their boxes, another set of paranormal events plagues Mia and her daughter. The next night, Mia is haunted by a malevolent presence in her apartment and believes it to be Annabelle's ghost. During a storm, Mia encounters an enigmatic figure in the building's basement who begins pursuing her before she escapes. Mia calls back Detective Clarkin to gather information about Annabelle and the cultist and learns that the cult intends to summon supernatural beings. With the help of bookseller and fellow tenant Evelyn, Mia realizes that the cult practiced devil worship, which summoned a demon who followed the family after they moved to their apartment so as to claim a soul. Upon returning home, Mia and Leah are attacked by the demon who reveals itself while manipulating the doll. Mia and John contact their parish priest, Father Perez, who informs them that demons sometimes attach themselves to inanimate objects as an advantage to accomplish their goals and that a human soul must be offered for a purpose. Without any hopes of exorcising the demon out of the doll, Father Perez decides to take it away to seek help from the Warrens for investigation. But before he can enter the church, the demon impersonating Annabelle's spirit attacks him and grabs the doll. The priest is hospitalized on the next day and, when John checks on him, Father Perez warns the latter that after sensing its powerful presence, the demon's true intention is to claim Mia's soul. That night, while Evelyn is visiting Mia, the demon uses Father Perez's physical form to sneak into the apartment and abduct Leah for her mother's soul. To spare her daughter, Mia attempts to jump out of the window with the doll but John arrives in time along with Evelyn to stop her. Evelyn decides to take her life in Mia's place instead as atonement for causing a car accident that resulted in the death of her daughter Ruby years ago. As the Forms are reunited, the demon and the doll disappear, while Leah is safely inside her crib. Six months later, the doll is bought from an antique shop by a mother as a gift for her daughter Debbie, one of the nursing students from the prelude of the first film. The film is a spin-off of the 2013 horror film The Conjuring, focusing on the origins of the Annabelle doll found in that film. The film was designed to be stand alone yet collectively catering to fans of "The Conjuring" who would already be familiar with the latter film. To Backstage.com, the film was one of the first in a new strategy by distributors Warner Bros. and New Line Cinema "that capitalizes on the built-in fan bases for successful films, allowing for smaller budgets and production time with a bigger payout on the back end." Casting was announced in January 2014, with Annabelle Wallis and Ward Horton playing the lead roles. with actors Eric Ladin, Brian Howe and Alfre Woodard also being announced that month. Principal photography began on January 27, 2014, at The Book Shop in Covina, California. On February 25, 2014, filming continued at an apartment on South Normandie Avenue in Los Angeles County, where the 55-member crew shot for several days. Director Leonetti and producer Safran told reporters that the Annabelle set was "haunted" and that they thought "supernatural phenomena" had occurred there. The film was shot in sequence so that the actors were always aware of their emotional arcs. On April 24, 2014, Joseph Bishara was hired to compose the music for the film. WaterTower Music released the soundtrack album on September 30, 2014. Annabelle grossed $84.3 million in North America and $172.8 in other territories, for a worldwide total of $257 million, against a production budget of $6.5 million. In the U.S. and Canada, Annabelle is the fourteenth highest-grossing horror/supernatural film. Early tracking projected Annabelle would gross around $25–27 million in its opening weekend. However, estimates declined shortly after to a range between $20–22 million. Annabelle was released on October 3, 2014, in 3,185 theatres in North America. It topped the box office in its opening day earning $15.4 million (including its $2.1 million midnight previews). In its traditional three-day opening the film debuted at #2 at the box office with $37.1 million, at an average of $11,659 per theater from 3,185 theaters after a neck-and-neck competition against Gone Girl that earned $37.5 million. The two releases were separated by $378,854. Its opening weekend gross is the eleventh highest in October and the biggest for a horror genre film of 2014, surpassing The Purge: Anarchy's $28.9 million opening. Dan Fellman, president of domestic distribution at Warner Bros., said about the opening box office performance, "we had a wonderful campaign for the film and a good date"; she added "being a spinoff of The Conjuring set it up really well and we just hit the right note." It is the second time that an October weekend has produced two $30 million or more debuts; the first was in 2008: High School Musical 3 ($42 million) and Saw V ($31 million). To Rentrak, the opening weekend crowd was evenly split between females with 51% and under 25 years with 54%. The film's theatrical run ended on December 18, 2014, and it earned a total of $84 million, becoming the thirty-fifth highest-grossing movie of 2014 in the US. The film was released in Russia on September 26, 2014, a week prior to its wide release and earned $2.1 million on its opening weekend, debuting at No. 3 at the Russian box office. Overseas, in its opening weekend the film earned $23.6 million from nearly 3,300 screen and 39 foreign markets for a first-weekend worldwide total of $60.8 million. High openings of Annabelle internationally were reported in France ($3.4 million), Brazil ($3 million), the UK ($3.1 million), Argentina ($1.2 million), Spain ($1.45 million) and Germany ($1.14 million). In India Annabelle debuted at #2 behind Bollywood blockbuster Bang Bang! and collected $1.3 million. It set an all-time opening record for a horror film in Peru with $1.34 million which is also Warner Bros. second biggest opening weekend of all time there overall. In Mexico, the film earned $10.9 million (including previews) on its opening weekend and broke the record for the biggest debut ever for a horror movie, and the best 2D opening. Its opening weekend gross is also the third-biggest opening overall of 2014 behind Maleficent and Transformers: Age of Extinction there. In total, the film took 59% of the total market share. As of October 13, 2014, Annabelle has become the highest-grossing horror film in the Philippines, earning over ₱121.33 million. The film surpassed Insidious: Chapter 2's record (₱113 million), doing so after 12 days of release. The film has also become the highest-grossing horror movie in Lebanon after staying atop the box office for two weekends. Annabelle received generally negative reviews from critics, many of whom felt the film inferior to its predecessor. The review aggregator website Rotten Tomatoes reports an approval rating of 29% based on 125 reviews, with an average rating of 4.4/10. The site's critical consensus reads, "Annabelle borrows unabashedly from better horror films, content to leave viewers with a string of cheap jolts that fail to build on the far more effective The Conjuring." On Metacritic, the film has a weighted average score of 37 out of 100, based on 27 critics, indicating "generally unfavorable reviews". Audiences polled by CinemaScore gave the film a grade of "B" on an A+ to F scale. Frank Scheck of The Hollywood Reporter criticized the film for its cheap production and screenplay, but was positive towards the performances of the cast and saying, "the film is ultimately so scary and formulaic that you won't forget it." Scott Foundas of Variety gave the film a positive review, calling the film "inspired" but periodically cheap. He added "a cut-rate spinoff from James Wan's superlative haunted-house hit The Conjuring that (partly) makes up in crude shock effects, but lacks in atmosphere. Designed mainly as a starring vehicle for the eponymous, creepy-as-hell doll (who easily outclasses her human co-stars), this WB/New Line quickie is the thirst of die-hard genre fans and is by the far the best horror movie of the year". Pete Hammond of Deadline gave the film a positive review and said that the scary doll show has left him pining for Chucky in Child's Play. He further added, "Annabelle may still draw horror fans in this Halloween month, and they will be quaking over the scares in this film." In October 2014, Fellman told The Washington Post that the studio was considering a series based on the film, with a sequel already in the works. In October 2015, it was reported that Gary Dauberman would be returning to write the script. On March 22, 2016, Warner Bros. slated the film for release on May 19, 2017, with Lights Out director David F. Sandberg directing the film. In June 2016, Miranda Otto and Stephanie Sigman were cast to star in the prequel. The story centers on a dollmaker, and his wife (Otto) whose daughter tragically dies. Twelve years later they decide to open their home to a nun (Sigman) and several girls from a shuttered orphanage. When the dollmaker's possessed creation Annabelle sets her sights on the children, it turns their shelter into a storm of horror. In April 2018, Warner Bros. announced July 3, 2019, as the release date for an as-yet untitled new film in The Conjuring franchise. Later that month, it was announced that the film will be a third Annabelle film, with Gary Dauberman signed on to write and direct, in his directorial debut. James Wan and Peter Safran will co-produce the project. On February 21, 2019, the film was pushed up five days to June 28. In March 2019, The title was revealed as Annabelle Comes Home. The film offers a nod to Rosemary's Baby with the leads named Mia and John after Mia Farrow and John Casavetes who starred in that film. ^ "Annabelle (15)". British Board of Film Classification. September 26, 2014. Retrieved September 26, 2014. ^ a b c "Annabelle (2014)". Box Office Mojo. Retrieved August 6, 2015. ^ Reilly, Mark (November 8, 2013). "The Conjuring Gets a Spin-Off Movie with Annabelle!". Schmoes Know. Retrieved February 2, 2014. ^ "Annabelle Premiere". United Press International. Retrieved September 30, 2014. ^ "Warner Bros Scheduling Spree Continues With The Conjuring 2, Mean Moms, 2 Others". Deadline Hollywood. February 25, 2014. Retrieved February 26, 2014. ^ "Annabelle". Film Music Reporter. September 17, 2014. Retrieved October 31, 2014. ^ a b c Rodriguez, Briana. "1 Strategy That Helps Annabelle Director John R. Leonetti". Backstage.com. Retrieved February 14, 2016. ^ Sneider, Jeff (January 15, 2014). "New Line's Conjuring Spinoff Annabelle Casts Its Leads". TheWrap. Retrieved February 2, 2014. ^ a b McNary, Dave (January 30, 2014). "Alfre Woodard Materializes in Horror-Thriller Annabelle". Variety. Retrieved February 2, 2014. ^ Creepy, Uncle (January 28, 2014). "Two More Actors To Be Haunted By Annabelle". Dread Central. Retrieved February 2, 2014. ^ McNary, Dave (January 15, 2014). "The Conjuring Spinoff Annabelle Starts Shooting Jan. 27". Variety. Retrieved February 2, 2014. ^ Bussey, Ben (January 31, 2014). "The Conjuring spin-off Annabelle starts production". Yahoo! Movies. Retrieved February 2, 2014. ^ Verrier, Richard (February 25, 2014). "Conjuring spinoff Annabelle is filming in Los Angeles". Los Angeles Times. Retrieved February 26, 2014. ^ Casas, Alyssa (September 30, 2014). "Annabelle Director John Leonetti Talks About Shooting on a Haunted Set". The Hollywood Reporter. Retrieved October 12, 2014. ^ "Joseph Bishara Scoring Annabelle". Film Music Reporter. April 24, 2014. Retrieved October 31, 2014. ^ "Annabelle Soundtrack Details". Film Music Reporter. September 17, 2014. Retrieved October 31, 2014. ^ "Horror – Supernatural". Box Office Mojo. Retrieved December 7, 2014. ^ a b McClintock, Pamela (September 30, 2014). "Box Office: Will David Fincher's Gone Girl Be Upstaged By a Demonic Doll?". The Hollywood Reporter. Retrieved September 30, 2014. ^ Cunningham, Todd (September 30, 2014). "Annabelle Is Ready to Raise the Dead Horror Movie Box Office". TheWrap. Retrieved October 1, 2014. ^ Agar, Chris (October 1, 2014). "Box Office Prediction: Gone Girl vs. Annabelle". Screen Rant. Retrieved October 1, 2014. ^ Bowles, Scott (October 2, 2014). "Box Office Preview: Gone Girl, Annabelle To Dominate Weekend". Deadline Hollywood. Retrieved October 3, 2014. ^ Lang, Brent (October 1, 2014). "Gone Girl, Annabelle in Dead Heat at Weekend Box Office". Variety. Retrieved October 2, 2014. ^ "Widest Releases (or The 3,000+ Club)". Box Office Mojo. Retrieved October 3, 2014. ^ Khatchatourian, Maane (October 4, 2014). "Gone Girl Headed for $38 Mil Weekend Win, Annabelle Tops Friday Box Office". Variety. Retrieved October 5, 2014. ^ McNary, Dave (October 3, 2014). "Box Office: Annabelle Tops Gone Girl with $2.1 Million Thursday Night". Variety. Retrieved October 3, 2014. ^ Subers, Ray (October 5, 2014). "Weekend Report: Moviegoers Thrill to Gone Girl, Annabelle This Weekend". Box Office Mojo. Retrieved October 7, 2014. ^ Lang, Brent (October 5, 2014). "Box Office: Gone Girl, Annabelle Stun With Big Debuts". Variety. Retrieved October 6, 2014. ^ Mendelson, Scott (October 5, 2014). "Weekend Box Office: Gone Girl Scores $38M, Annabelle Nabs $37.2M". Forbes. Retrieved October 6, 2014. ^ "2014 Domestic Grosses". Box Office Mojo. Retrieved January 1, 2015. ^ Kay, Jeremy (September 28, 2014). "Maze Runner adds $29m int'l". Screen Daily. Retrieved September 30, 2014. ^ Busch, Anita (September 29, 2014). "Box Office Final: The Equalizer $34.1M; Boxtrolls $17.2M For No. 3 Behind Maze Runner's $17.4M". Deadline Hollywood. Retrieved September 30, 2014. ^ Tartagloine, Nancy (October 5, 2014). "Int'l Box Office Update: Breakup Buddies In Huge China Debut; Gone Girl A Beaut With $24.6M; Bang Bang Holsters $25.4M; More". Deadline Hollywood. Retrieved October 6, 2014. ^ McClintock, Pamela (October 7, 2014). "Box Office Final: David Fincher's Gone Girl Narrowly Beats Annabelle". The Hollywood Reporter. Retrieved October 7, 2014. ^ Cunningham, Todd (October 6, 2014). "Annabelle Rakes In Nine Times Its Production Budget in First Weekend Box Office". TheWrap. Retrieved October 7, 2014. ^ a b Kay, Jeremy (October 12, 2014). "Dracula Untold grossed $33.9m from 42 territories as the early tally climbed to $62.6m. Separately Fox International executives said the company's box office has amassed more than $3bn for the year-to-date". Screen Daily. Retrieved October 13, 2014. ^ Tartaglione, Nancy (October 26, 2014). "Int'l Box Office: Annabelle Still A Doll With $26.5M Frame; Fury Wages $11.2M; Lucy Outmuscles Hercules In China; Guardians Warps To #3 On 2014 Global Hit List; More". Deadline Hollywood. Retrieved October 27, 2014. ^ Subers, Ray (October 26, 2014). "Around-the-World: Annabelle Rules In Mexico, Guardians Passes X-Men". Box Office Mojo. Retrieved October 28, 2014. ^ "Annabelle now the highest-grossing horror film in Philippines". October 15, 2014. Retrieved October 16, 2014. ^ Tartaglione, Nancy (October 27, 2014). "Int'l Box Office Final: Happy New Year Uncorks Record Bollywood Bow; Annabelle Still A Doll With $26.2M; Lucy Outmuscles Hercules In China; More". Deadline Hollywood. Retrieved November 2, 2014. ^ Lackluster, Oliver (October 3, 2014). "Annabelle: Horror prequel scares up lackluster reviews". Los Angeles Times. Retrieved January 16, 2015. ^ "Annabelle (2014)". Rotten Tomatoes. Retrieved February 3, 2015. ^ "Annabelle". Metacritic. Retrieved February 3, 2015. ^ Scheck, Frank (October 2, 2014). "Annabelle: Film Review". The Hollywood Reporter. Retrieved January 16, 2015. ^ Foundas, Scott (October 2, 2014). "Film Review: Annabelle". Variety. Retrieved October 3, 2014. ^ Hammond, Pete (October 2, 2014). "Annabelle Review: Pete Hammond On Scary The Conjuring Prequel". Deadline Hollywood. Retrieved October 12, 2014. ^ Kang, Cecillia (October 9, 2014). "The sums of all fear: Horror makes a Hollywood comeback". The Washington Post. Retrieved October 19, 2014. ^ McNary, Dave (October 16, 2015). "Anabelle Sequel Moving Forward at New Line". Variety. Retrieved October 17, 2015. ^ Han, Angie (March 22, 2016). "Ben Affleck's Live By Night and Annabelle 2 Get Release Dates". /Film. Retrieved March 22, 2016. ^ "Annabelle 2 Cast Adds Miranda Otto and Stephanie Sigman". ComingSoon.net. June 22, 2016. ^ Borys Kit (April 27, 2018). "'Annabelle: Creation' Sequel in the Works With Gary Dauberman Directing (Exclusive)". The Hollywood Reporter. Retrieved April 28, 2018.